Listening to Andy Bey is like dreaming about what you’ve never been. And perhaps this is what fueled Bey in the first place—the opportunity to imagine in sound, in phrase, and in melody a world yet to be inhabited by those singers male and black. It is all too easy to suggest that a vocalist like Bey might have been listening to Bobby Blue Bland, Solomon Burke or even Ira Tucker—as they all were—but there’s something about Bey’s delivery that suggest something more original and dare I say substantive—at least on the level of style. Bey is one of a kind—something you could only conjure in a dream, really. I often think about this notion of originality. A colleague of mine, Richard J. Powell, an art historian of some stature, has suggested that no artist is influenced (inspired maybe? ), but it’s all about an active appropriation of something else(s) in route to something of their own. Ok, so Sinatra had Billie Holiday in his head and Marvin Gaye had Sinatra in his (“…in the wee small hours of the morning…) and Ronald Isley and Bobby Womack—peers and contemporaries of Sam Cooke—no doubt recalibrated because of Cooke (like Ms. Dinah did for Aretha and Nancy Wilson), though Cooke himself found the road to Damascus trying to sound like R. H. Harris? And nobody would say that any of these folk weren’t American originals, so that’s not my point. But sometimes there is simply little that can qualify or quantify talents that just seem to drop from space. Either these singular forces change the whole endeavor—like James on-the-One or Ms. Billie’s subdued, though still sublime field moans—or they go unrecognized simply because there’s little logic behind their very presence. And indeed there are any number of women folk who I’m thinking of here—Linda Jones, Betty Davis, and Bettye LaVette to name a few, but I’m also thinking about men folk like Donald Smith, Terry Callier, Jon Lucien, (even) Will Downing and of course Bey, who are almost always an afterthought when we talk about the those singers male and black, who have been charged with moving mountains and parting seas with just the turning of phrase (call it black music’s Moses complex). 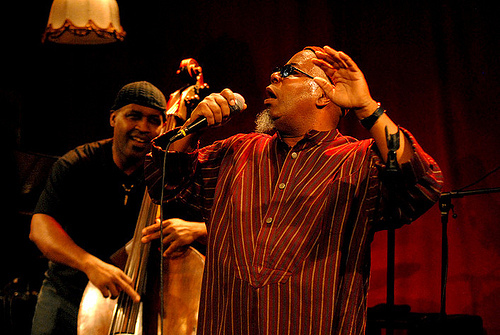 I dream men like Dwight Trible—these singers black, these singers men—even as they tug at those baritone and tenor strings that so embody the very idea of some pristine, immaculate dark masculinity. Their willingness to explore the full range of their expressiveness—emotiveness gone awry—simply undermines the comfort that the deepness of their voices presupposes. And it’s not like this is a new phenomenon—figures like Jimmy Scott, Ronnie Dyson, Eddie Kendricks, and Rahsaan Patterson are standard bearers of sort for this thing, but because they live(d) in a register up-above, it has always been easy to dismiss their presence—and their art—as being less than something fully masculine (as if there was such a thing). And this is where men like Trible and Jose James (like Bey and Johnny Hartman) force us to re-imagine our investments in masculinities that don’t bend and don’t break. Dwight Trible—who can make you cry—has filled a void left by the great Leon Thomas (the only vocalist other than the late Phyllis Hyman to successfully match wits with saxophonist Pharaoh Sanders). A mainstay of the Build An Ark (let it rain, let rain) collective and Trible even has a foot in the hip-hop world via his work with The Life Force Trio (something like Archie Shepp unleashed on a Primo soundscape). But to understand Trible is to acknowledge those he’s…ahem…appropriated. When asked about his “influences” Trible responds “Do you know Linda Jones?... She opened up the spirit and let it all out, you know I mean, Oh God she was something special and if you listen to a record by her, you’ll probably hear her influences on me in there.” And of course the notion that Trible was “influenced” by Jones, belies the fact that Linda Jones is one of those obscure geniuses that one would have to actively seek out; Linda Jones doesn’t just fall out of the sky into your lap. The Living Water, Trible’s grand opus (to date), is at once a tribute to the giants whose wells he replenishes from—Coltrane, Malcolm, Wayne Shorter, Abbey Lincoln, Freddie Hubbard, and the aforementioned Andy Bey—but also a measure of an art that literally flows, taking with it elements of all it comes in contact with. As such it’s difficult to listen to Trible’s breathtaking reimagining of Bey’s “Celestial Blues” and not feel as though the full weight of this culture and this music (“this” as a signifier of “that” which we still struggle to adequately qualify and quantify as the force of blackness—a black hole if you will, which gives life and light) is coming through in every phrase and every note. And yet, this gets us back to this notion of originality—and thinking that perhaps artistic originality is ultimately about the willingness of an artist to speak back to that which she so thoroughly takes from.